The Billionty-Oneth Geek: DTV Madness: THE TOURNAMENT!!!!! I don't know if it's a good or bad thing but today I watched Public Enemies, a film by Michael Mann with the likes of Johnny Depp and Christian Bale and later I watched The Tournament, a DTV lower budget action movie. For whatever reason, I enjoyed the latter more. I guess it appealed more to my primal sensibilities. 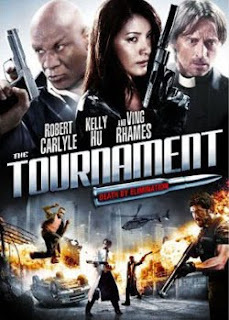 Although The Tournament was produced on a low budget, it was still a higher low budget movie than your usual fare. I think this movie is as close to an American version of Battle Royale that we're going to get. Basically every 7 years there's a tournament held by all the big wigs and high rollers that pit 30 different killers together in a last man standing battle. The winner is awarded $10 million dollars. The tournament lasts 24 hours and at that time, if there is no winner, then a tracking device lodged inside their bodies would explode, killing them in the process (just like Battle Royale!). There's all sorts of wacky killers in this movie, from your straight up martial arts experts, to gun toting muscle men and even a parkour enthusiast. Amongst all these ruffians is a priest, who is not a killer, but gets tangled in this mess of a tournament by drinking the wrong cup of coffee (I kid you not, how awesome is that). Aside from that, the movie is a top to bottom action spectacular. The style of action is definitely a throwback to that 80s style of action. The exploding bodies and heads were much appreciated by this author. There's also an awesome montage scene in the middle of the movie as a fast forward way of cutting down the ranks of those still alive in the tournament. I have no doubt that if this movie were released in the 80s during the action movie boom period, that it would have done bonkers at the box office. It's unfortunate that the standards for theatrical run movies have changed so much that movies like this wouldn't stand a chance. Also, don't let the generic movie title fool you, there are actually some mainstream celebrities in this movie including Ving Rhames (Final Fantasy: The Spirits Within), Robert Carlyle (28 Weeks Later) and the foxy yet somehow aged 41, Kelly Hu (Friday the 13th Part VIII: Jason Takes Manhattan). Rhames does a great job of playing a heartless Terminator-like killer while Carlyle does a great job as the sympathetic priest. Hu, probably the weakest of the three, is great when she's fighting, but in speaking parts, they make her use this fake-assed chinese accent when speaking english and it is purely dreadful (note: she is not pure Chinese). If you watched Spike TV the past 2 weeks or so then you probably saw TV spots for this movie. It's nice that movies like this get some sort of advertising so that they don't completely disappear into the ether of the Blockbuster Video shelves. This movie comes highly recommended if you want some mindless action! Until next time, later geeks!